We have the skills and expertise to devise training courses, events and programmes, to deliver training in our own specialist subjects and to oversee the delivery of large scale training programmes on environmental themes. We have undertaken many training events for community groups and interested parties looking for specific information on environmental issues. This includes one-off information evenings, short programmes delivered in a series of workshops, and longer term integrated programmes on a number of subjects. Subjects include wildlife and its enhancement, general sustainability principles and taking action to reduce energy consumption and ecological footprint. We have obtained accreditation for some of these courses. We have devised and delivered training programmes to technical audiences. 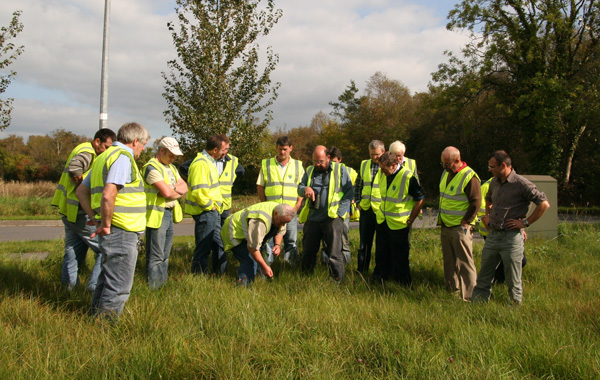 This includes week-long biodiversity training courses for 15 Local Authorities in Ireland and the provision of detailed accompanying guidance documents. Subjects within these programmes includes compliance with environmental legislation such as the EU Habitats Directive, best practice in Appropriate Assessment, management of parks and open spaces for wildlife and dealing with invasive alien species. Woodrow has undertaken wildlife audits for communities and has produced wildlife action plans. We have a national TidyTowns adjudicator on our staff as well as wildlife professionals with many years’ experience in practical projects and environmental awareness. We can therefore recommend projects that are achievable and appropriate for the best wildlife and community benefit. With staff involved in adjudication, we also have great experience in all aspects of TidyTowns strategic planning and can offer a high quality of service in this. Project animation is a phrase that is increasingly encountered with respect to working with communities. Essentially it means making things happen and, often requires a considerable amount of input to let people know about a project, to encourage their participation in the project, and to support them in getting the most out of a project. Our history of working with many stakeholders and communities, environmental knowledge and understanding of issues critical to effective project animation and management such as common pitfalls, PR and funding means that we have found ourselves very well placed to work as project animators, particularly in rural and environmental initiatives.